There are a handful of recipes I think everyone should master: a perfect roast chicken, a simple pasta sauce, chicken soup, a standby vinaigrette, a flawless chocolate cake. I’ve made variations of these, and then found one that struck all the right cords and promptly tucked itself into my little arsenal, for good. These little favorites make me feel well equipped, you know, as if I have a trick up my sleeve to deal with whatever life might throw my way. A sick husband? I’ll have that pot of soup simmering in no time. Too harried to cook? This pasta sauce comes together so quickly, you won’t even feel it. And I don’t know what it is about roast chicken, but from the moment you put in the oven, its aromas spread so quickly through your house, beckoning with the promise of dinner, so inviting, so warm, so much like home. Guests coming? Celebrating something? That’s where this chocolate cake comes in. I’m of the persuasion that anything that tastes good tastes better with chocolate, and once I made this cake, it plunked itself on a pedestal and forever made all other desserts redundant. 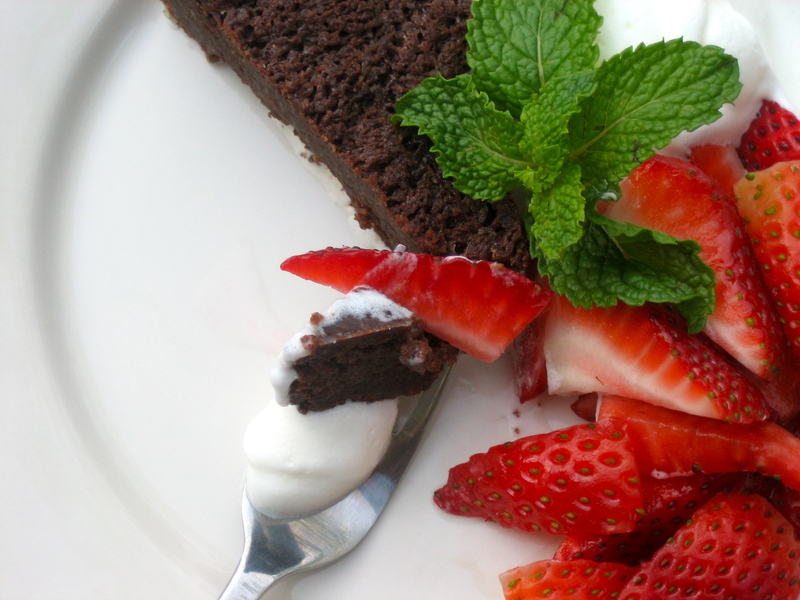 Often, when I’ll be thinking about what to make for dessert for a special occasion, I’ll start out with three or four options, and then when it’s time to go grocery shopping I’ll more often than not cross them out and scribble: Easiest Chocolate Cake. 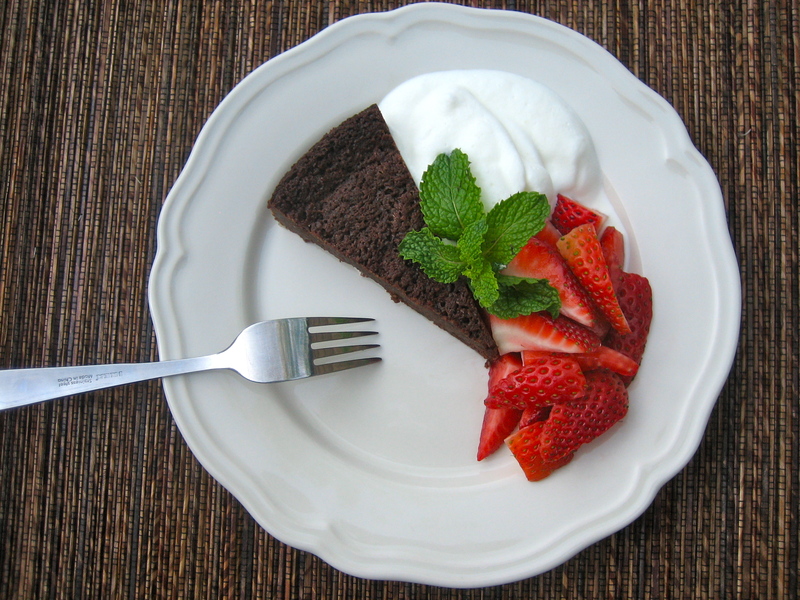 I think that most people would prefer a chocolate dessert, and with a dream genetic makeup of “super easy”, “uses only one bowl” and “freezes incredibly well”, it’s not just the flavor that gives other desserts a run for their money. I turn to this time and again, and I hope you will, too. My mother sometimes tries to talk me out of my little patterns, like “Oh, you’re making that again? Why not try something new?” (Usually in response to my Curry Chicken). But for me there are some recipes that just don’t need improving upon. Sometimes I go into the kitchen craving drama or the thrill of experimenting with something new, while at other times, I go in with the kind of patience it takes to spend an entire afternoon crafting an intricate multi-layer cake. But usually, I go into the kitchen seeking comfort, relief. My body eases up as I hold my hands under the faucet, washing vegetables, the negative energy oozing out with the blade of my knife hitting the cutting board. Cooking becomes almost meditative, a way to relax and calm down. I get into a rhythmic flow I can only have with a recipe I’ve done over a dozen times, where the page is dog-eared and stained, and my mind is free to wander. And where the smells wafting from the kitchen bring back a kaleidoscope of images and signal a rootedness in life. My life. And I can sit back on the couch and pick up a book, thinking about the way he asked for the recipe when he was away, or the way it made her smile for the first time in a very long time, because I’m not busy fretting to see if it will turn out well. I know it will. Oh, you want that recipe? It’s right here, in Molly Wizenberg’s beautiful prose. Her description of the batter as “smooth, dark, and utterly gorgeous” makes me smile. Every. Single. Time. A few notes: I’ve made this cake with regular butter, as well as with margarine, and it works just fine. Also, I just made this for our Passover Seder with cocoa powder instead of the tablespoon of flour. And worth restating: it freezes beautifully. Hi! I’m really interested in this recipe but for some reason it’s not listed and there isn’t a link to it below the intro like your other recipes. Is there any way you could email it to be or a link to it? I tried your perfect matbukha and my Israeli friends loved it and said it was like the little old ladies make back home…I also made the challah bread from scratch to go with it….and it was my first one EVER making any kind of bread from scratch and it was PERFECT!!!! That mousse looks divine!!!! Can’t wait to try it. Cheers!